This font is called 12 TO THE MOON, after the movie of the same name. Not sure what you would ever do with it, but I had fun making it and working with it. The movie is one of very many black-and-white 1950s sci-fi movies that would end up on Mystery Science Theater 3000. Three times a strange message appears on the screen on the ship, like the animation on this page. Luckily, the ship’s “astrophotographer and pharmacist” (played by Michi Kobi, left) is able to translate it. The alien language translation thing is always problematic; one could fill a book with the lame ways that screenwriters have tried to get around this. Anyway, the same 46 symbols appear again and again and I’ve made this silly little font out of them. The characters are located at the 0-9, A-Z, and a-j positions. Isn’t this cool? When I made this font, I wasn’t sure what anyone would use it for. 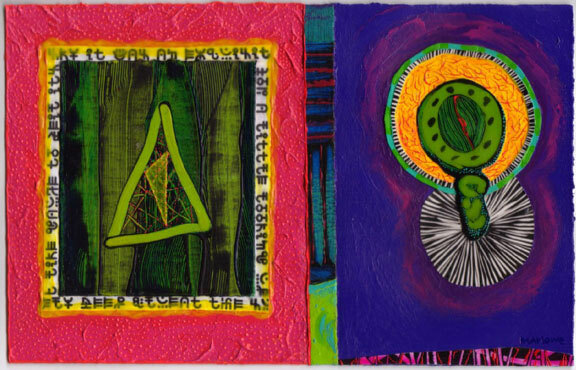 Below is Collage Diptych IV by my friend, artist Willie Marlowe.